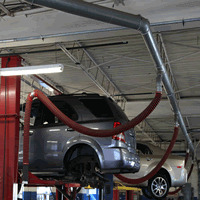 Fume-A-Vent System for Hollywood Motor Co.
"We converted an old shop into a 4-bay auto repair garage. Fume-A-Vent listened to our needs, designed a system, and provided us with all of the parts for thousands less than comparable systems. We couldn't be more happy with the end result." Application: Rope-and-Pulley Simple Drop Systems and Tailpipe Adapters implemented at Auto Dealership & Repair Shop, Hollywood Motor Co.
Summary: Hollywood Motor Co. purchased an older building and garage and turned the lot into an Automotive Dealership with corresponding repair garage. 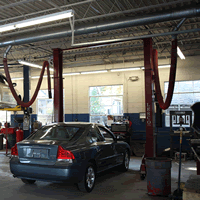 The existing garage required a vehicle exhaust extraction system. Challenge: Hollywood Motor Co. services a large variety of vehicles and didn't have the budget to install an elaborate exhaust extraction system. 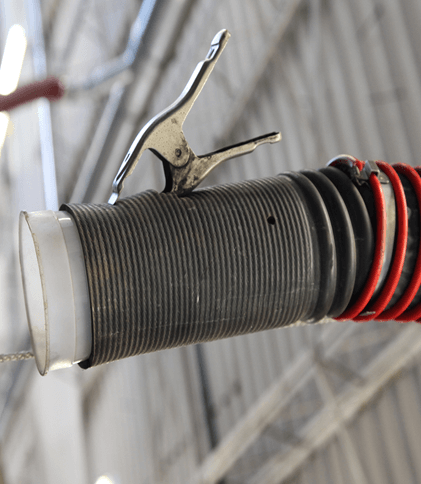 Solution: Fume-A-Vent provided Hollywood with a rope-and-pulley simple drop system that allowed for dual exhaust service at each of their lifts. 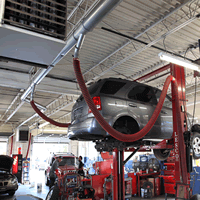 The system pulls nicely up and out of the way when it is not needed, and is conveniently available for when it is. 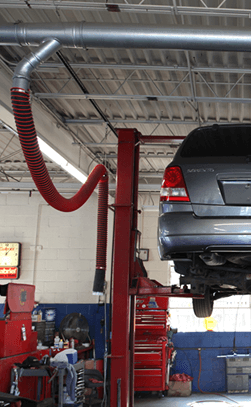 A proper tailpipe adapter pairing ensures that they can work on all different types of vehicles.